We’re just cruising through January faster than ever before it feels like. It really is true what they say: As you get older, time just seems to move faster and faster. Although the winter months can be quite rough, especially January, I’m savoring this time. For me, it’s a great time for introspection, self-care, creativity and reconnection with well being. I hope you are finding the darker months nourishing in some way. 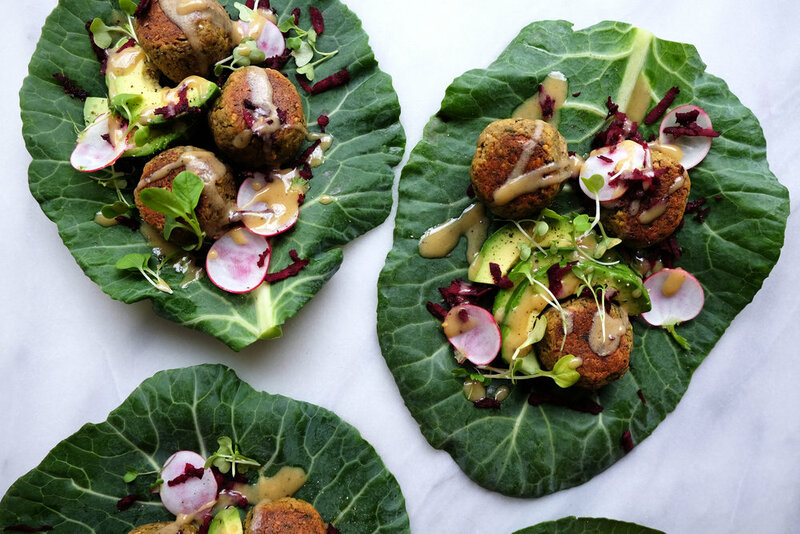 These falafel wraps are just so yummy! Light yet super satisfying. I love the collard wraps, but you could serve these with pita or a whole grain instead. A yogurt-based sauce would also be lovely on these in place of the tahini. If you are sensitive or allergic to soy, you can swap the tempeh for 2 cups of chickpeas here. Also, feel free to double the recipe. The falafel will keep well in an air-tight container in the fridge for 3-5 days. It’s nice to have some on hand through the week to add to salads or roasted veggie bowls. 1.) Preheat oven to 375°. Line a baking sheet with parchment paper. 2.) To make falafel mixture, pulse parsley, mint and pistachios in food processor until well chopped. Add the tempeh, shallot, garlic, olive oil, cumin, nut flour, baking soda, salt and pepper and blend for about 20-30 seconds until mixture is combined but not smooth. 3.) Roll falafel dough into 12 balls. Place them on parchment-lined baking sheet. Bake for about 18 minutes, turning halfway through. Falafel should be browned on two sides. 4.) Meanwhile, make the sauce by whisking all ingredients together in small bowl or jar. Prep veggies for wraps. 5.) Assemble the wraps and enjoy!